Philosophy skin care is one of the best selling lines of skin, body, and facial care available on the market today. Developed by a former CEO of a research lab, this brand strives to make skin look so good that "makeup is optional." The company's creator and CEO, Cristina Carlino, used to head the research firm BioMedic. Now, she uses her knowledge to create a line of products that enhance and invigorate all kinds of skin. She also invented the now popular "micro-peel" and trains professionals to use her techniques. Carlino emphasizes simplicity and beauty in the making and marketing of her products. Baby pictures from employees' personal books are used on product packaging and within the company website. Lowercase letters are used throughout to embrace the child in everyone. Several other areas of importance are emphasized by Carlino. Philosophy products are based on the idea that beauty does not correlate with skin color, gender, or age. Simplicity and balance should be found through thinking and feeling. A person should maintain integrity and health in appearance. A combination of several leading topical ingredients makes the promise possible. Some of these ingredients include: phospholipids, lecithins, salicylic acid, beta glucan, and SPFs. Each product is specifically formulated to work as best as it can. Philosophy skin care always seeks out new technologies and delivery systems. When possible, plant extracts, pure oils, and antioxidants are used in the making of their products. Animal testing is not done by this company, although over the years, some raw ingredients common in cosmetics have been tested on animals by other companies or firms. The corporate charity policy is that "to give is to receive." Each month, or even week, products are featured where proceeds go to charitable foundations. Some current charities include the National Colorectal Cancer Research Alliance, Women's Cancer Research Fund, Christopher Reeve Foundation, and Rainforest Foundation. The corporate website is easy and simple to navigate. In addition to giving detailed information about the science and creator of the brand, it also has many user-friendly features. Customer comments are available to read and give on various products. Based on merchandise selections, other items a customer may like are suggested. Each product has a "how to apply" tips section. Additionally, people interested in the brand can sign up for a free email newsletter. 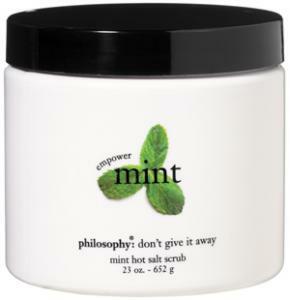 One of the newest products produced in the Philosophy skin care line is the Empowermint Salt Scrub. Its main use is to exfoliate and polish dry, rough skin. It is oil free, and can be used before self-tanning. The suggested retail price is $25 for a 20-ounce jar.Leading skincare and makeup website/store Sephora also has two Philosophy products on its' best-selling list: Hope in a Jar and Amazing Grace Body Firming Emulsion. Hope in a Jar is a moisturizer for normal to dry skin. Active ingredients include lactic acids, beta-glucan, and antioxidants. Amazing Grace Body Firming Emulsion is a body moisturizer meant to firm and tone. Vitamins C and E, along with antioxidants, help to purify and revitalize skin all over the body. Several oils help soften and smooth skin. Amazing Grace is part of a larger line of related products within the Philosophy skin care regimen. Is Philosophy Right for You? If you're looking for top quality skin care products made by a charitable-minded company that emphasizes healthy skin, you just might find that Philosophy is the brand for you. Use the store locator provided on the company's website to find a retailer near you if you'd like to check out the product line for yourself.